In ‘Demolished’ Rachel Whiteread considers the socio-economic changes in Thatcher’s Britain and their impact on the number of homeless people in London. 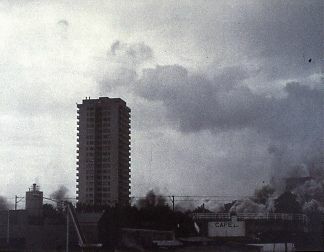 The demolished documents focus on the destruction of tower blocks in three different housing estates in Hackney, East London, between 1993 and 1995. These prints continue an examination of the themes underlying Whiteread’s celebrated work ‘House’, 1993, a concrete cast of the space inside a terraced house scheduled for demolition in Bow, East London, which came to stand as a monument to a lost community, destroyed by increasing gentrification.